Ganesha is a celebrated idol in India and Vinayakar Chaturthi is one of the grand festivals celebrated here on the belief of Ganesha’s Birthday. Despite being an atheist, Ganesha Idols are my favorites from childhood and I had been an ardent of Ganesha when I wasn't conscious about my belief, but I still like the idols of Ganesha that comes out in various and unique shapes. I know a friend in Flickr who has been a passionate collector of Ganesha idols and every year he used to arrange Golu (display of dolls) from the huge collection of Ganesha idols he had been collecting for years. Take a look at his Golu set (here) to wonder how huge is collection of Ganesha idols. Above (and beneath) is the picture of a clay Ganesha idol we bought for the festival at home. 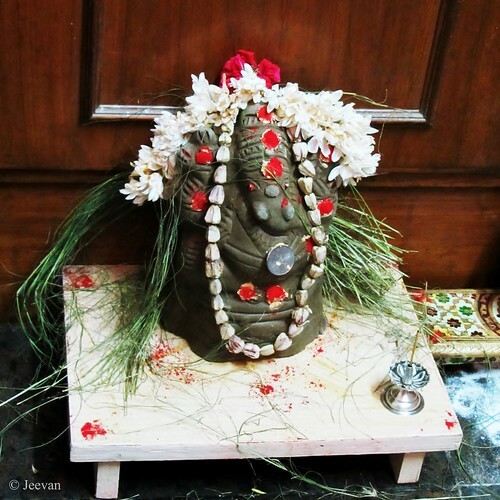 Parents purchased the idol a day before to the festival and placed under the Puja cupboard. We made vada, sweet pongal and chickpeas along with usual meals, and I spent most of the day watching special movies on television. Mom has decided to dissolve the clay idol into a bucket or tub water tomorrow, which we have been practicing for past half a decade, instead dropping the idol at sea or river. The dissolved clay water is later watered to the plants. 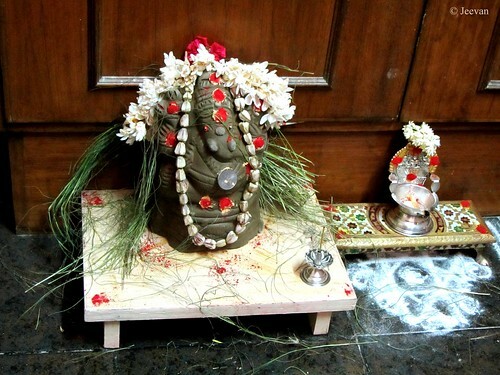 It is also believed the idol must be immersed at the end of the day of worship or three days later from then. Window, how mesmerizing and breezy it used to be! 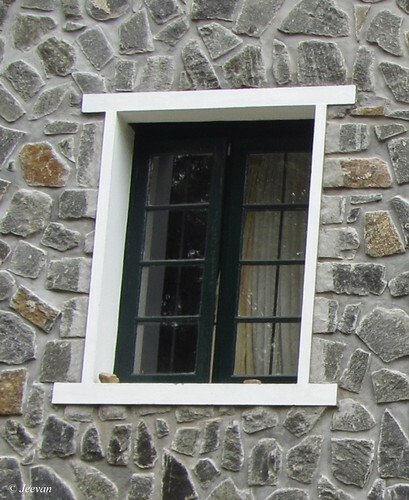 I believe windows are an essential factor of a house. It’s a crucial player in bringing the ventilation inside our home, to make breathe easy and versatile sight to cheers. I couldn't think living in a house without windows and I strongly believe life begins only outside the windows. I think not many could understand the wealth of windows like the author of My White Window and me – who spent days almost inside the house. Window means a lot to me. The windows are not meant the only ones at our homes. Every building installed windows in various shapes and frame work but the view we get were almost enchanting. I realize the worth of windows and I really want to mention something that made me felt the pulse of windows. During my course of war over lungs infection in early 2010, I was supposed to visit a lung specialist frequently related to my treatment and his clinic was on the 2nd floor of a building that we reach by a lift. He was a mid-aged doctor and kind being towards not only patient but everyone; and he treats with due care and concern which I haven't seen with any other doctors. Though every doctor treats patients to be cured, I saw something special in his way of approach and patience but not a bit of laziness or wearisome. The doctor room was well equipped including desktop computer and split A/C to check patients at his own comfort level; but he chose the nature way of ventilation though wide open windows. Being a lung specialist, no one could understand the importance of breathing and which is healthy inhaling unlike him who prefer to open air windows rather switched on to A/C. Through the entire visits to his clinic I saw him leaving the windows open, perhaps being on 2nd floor he might doing so I thought, but he follows the same at his resident come clinic at ground level. He also advised me to stay where I could get good ventilation. And if not the windows what can provide us such relief; and I’m also a kind, unroll the glasses whenever possible or elsewhere no pollution or heat occupy the space while on travel in car. I know cities aren't a safe zone to seek fresh air, but we aren't lost with oxygen is a consoling fact. Through window I see a world right opposite to my life inside the home. I don't envy at birds flying in the sky and butterflies fluttering in stunning coated wings, but I enjoy bearing fresh breeze on my face, the fragrance of flowering and chirrup of birds and crunching leaves. Well I can't explain much how heartwarming and pleasure looking through windows, a zone not so comfort like being at home. But I still and ever want to go outside exploring the glimpses I catch via windows. 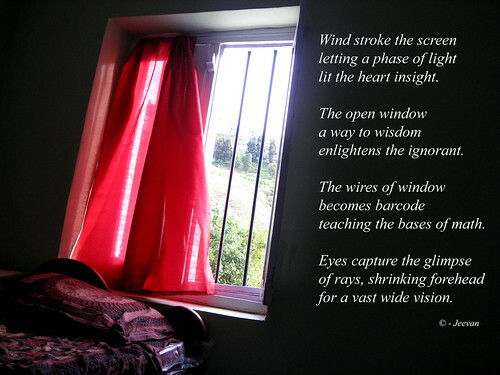 There are two windows that connect me outside home: other than the one which inspires me often through the sights, sound and sense of breeze that caught behind the window bars, the Microsoft windows of my PC helps communicate the message I got through motion scenes and emotional core. Both these windows lead me to a world of wisdom. I cherish and console me through various grief and emotions that I experience in everyday dilute of life. Other day while chatting, the sweet Preeti asked me to write a guest post on her blog. But for some unknown reason she’s could post it, so I make it way through my blog. I know Preetilata for long time through blog and she writes from deep heart and sometime lighter moments as cheerful. She’s one of a sweetest girl I ever know on earth and her blog (My White Window), is a best outlook for any writer and inspiration to come up with a post on windows. As she began a happy married life, I wish her all the best. in the morning rush hours. a flash that conveys quite comfort. 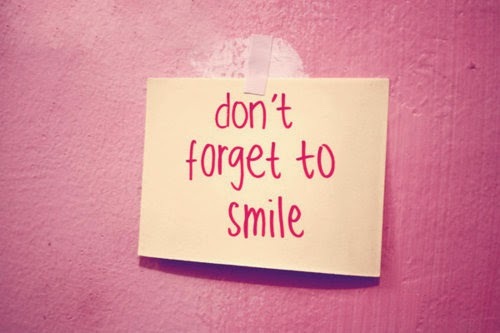 it made my day ahead cheerful. 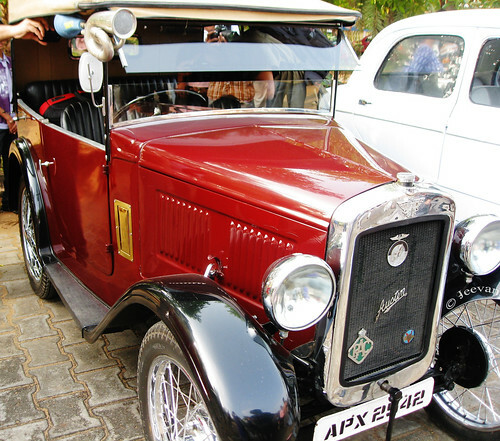 Shot at a heritage rally on vintage cars, couple of years back held at the VGP Golden Beach parking lot on ECR. Our city celebrates 375th year of establishment today… here I share a couple of photos on one of the city’s oldest bridges, Napier Bridge. Also known as Iron Bridge was built in 1869 by Francis Napier, who was then Governor of Madras. 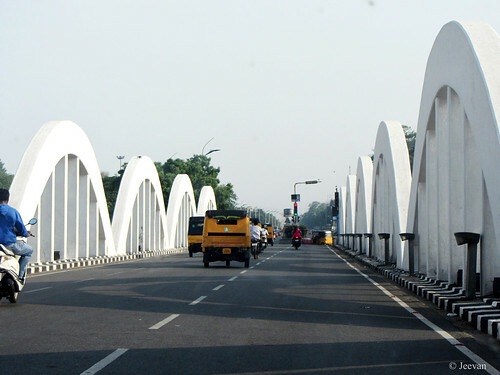 The bridge was constructed over the Cooum River, connecting Fort St. George with the Marina Beach. Although the bridge was narrow before, it was soon converted to a concrete structure in 1943 by Arthur Hope. 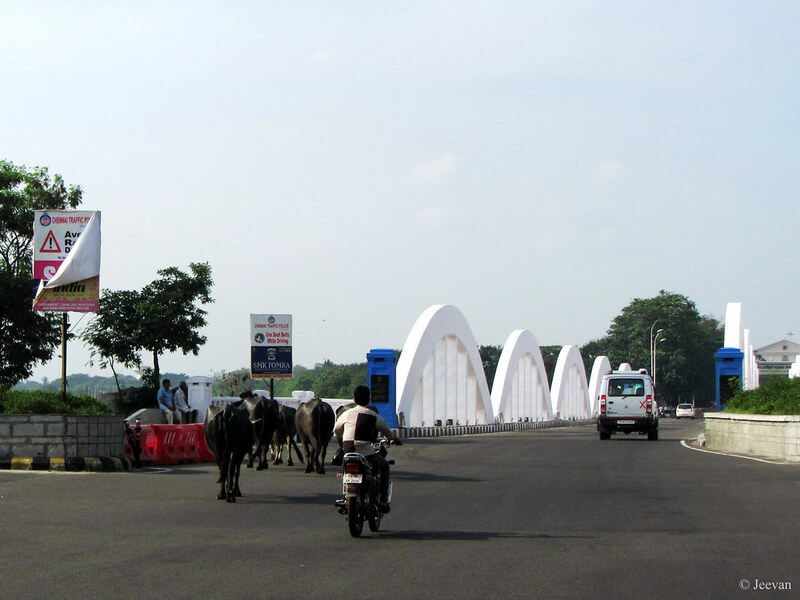 Alongside the old bridge, a new one was built in 1999 with a 10.5 meter-wide carriageway on the western side. The bridge is 138 meter long with 6 spans (bowstrings) across the river near the mouth. As part of the Marina Beach beautification, special lights have been fixtures beneath and on the arches and surface of the bridge, provides visual effect during night times. This architectural marvel stands tall and proud, making it one of the most significant landmarks in the city. My place of residence in Adyar, Chennai, has lot of monkeys! 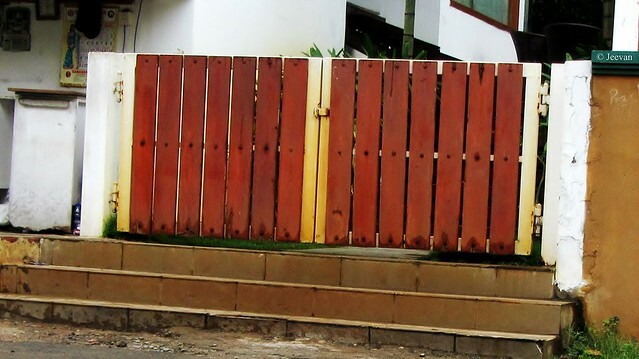 Since my native is Adyar, we transferred to the neighborhood area (buying a ground floor flat, 8 years back) to prevent difficulty of climbing up and down to the first floor home there. Now shifted back to Adyar for the last 5 months, mainly because of the emotional attachment my father hold towards this area and having been grown myself for more than 20 years here, he is more than three decades ahead of me. Though we couldn’t go back to our native home - which remained to be first and second floors since my uncle runs a workshop at ground floor - we had rented a house close to ours, therefore my dad don’t need to wander between the neighborhoods. I have seen monkeys (bonnet macaque) in my area even before shifted to neighborhood, though I had no idea about them until transferred back to Adyar. I not even thought that I would be back here like a bounced ball, but taking years to respond. For me where I reside becomes second, because I have come to believe that I don’t belong to one place. My intention was comfort and peace, and I am always open to experience new environment and ready to adapt anyplace with basic infrastructures. I dream of living in suburbs, where pollution and noise were at least. That too driven towards the southern districts rather closes to Chennai. 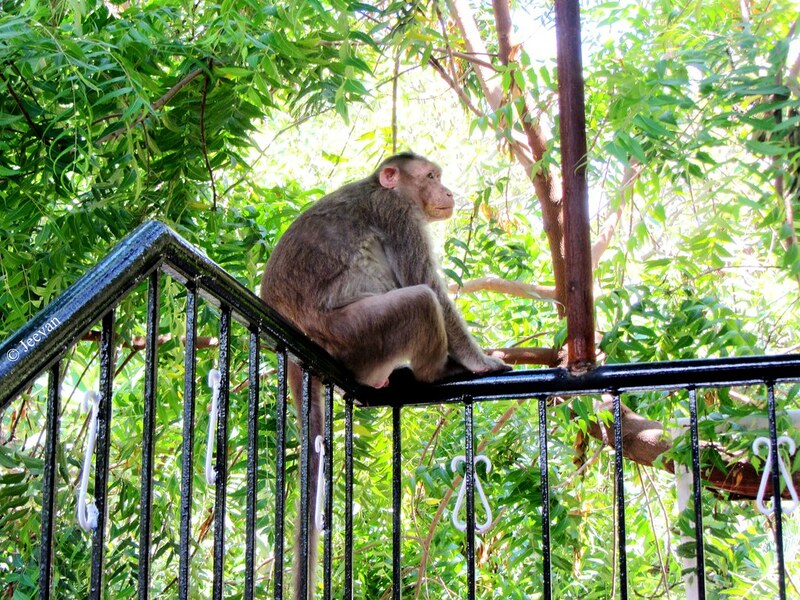 The monkeys here aren’t much troublesome, though they make their presence noticeable. At the rear of our house, canopy of trees (mostly large) sprawls for few hundred meters provides wonderful shelter to the monkeys from very young to aged. Also being very close to Adyar Theosophical Society and Besant Garden, which are very few patches of green across Chennai, adjacently, gives way to forest environment including number of rare flora and fauna. I’m really not sure these monkeys reside among the canopy of trees at the backyard, because they don’t make their way everyday across us. But few houses away from us used to make mild explosions sometime, which we come to know through our servant maid that they blast crackers to drive away the annoying monkeys. Mostly they come as a group or family, sitting here and there, climbing up and down and leaping through the branches of trees. 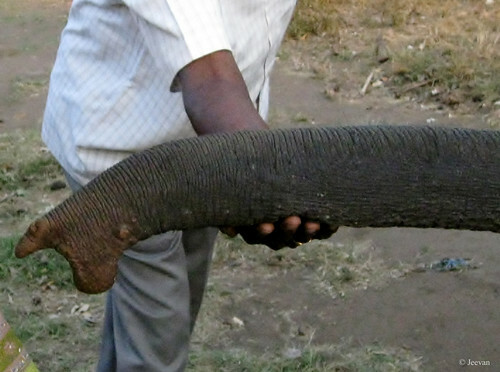 But they don’t stay long into our sight, as they keep moving like nomads. 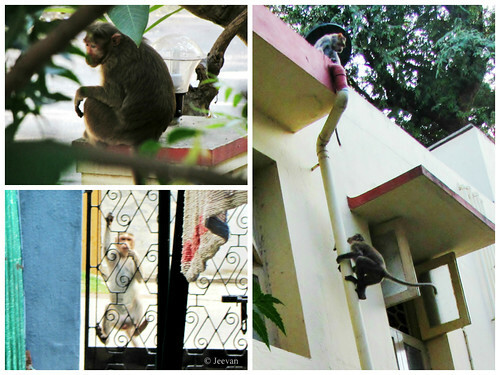 There are even huge monkeys (perhaps obese) among them, which could scare anybody with their looks. 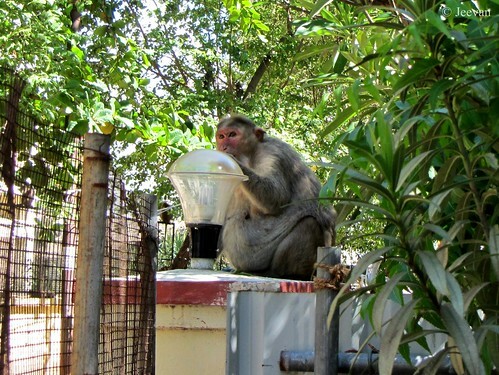 Before I go ahead continue with monkey stories, I need to say my house has inbuilt something pre-cautiously to prevent monkeys entering or looting things leaving its hands through the windows grills. Or perhaps through their early experience with monkeys annoyance, the owners of the house has made additional frames of net to the existing windows, so that we could open the windows without fear of monkeys. A monkey here also tried to scare me once, when I was alone. I working on my laptop other day and suspect something leaps off the window before I saw it clearly. But our pet, which was sleeping near my wheelchair, alerted me by suddenly barking at the window. Initially I too thought it must be a cat, but following the incident above it sounds certainly to be a monkey. Our pet haven’t seen monkeys often, so she kept barking every time they come around and also become crazy to chase them. 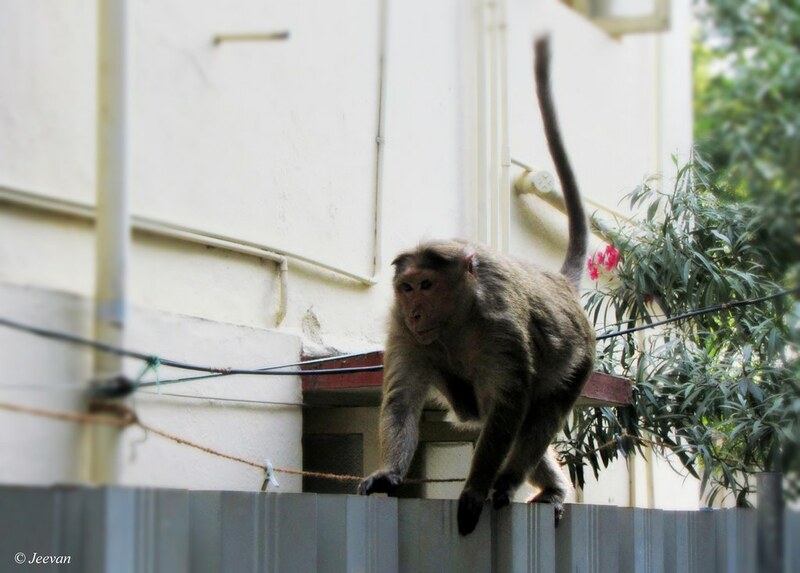 My mom was plucking flowers one evening (from daily jasmine vine), which has become her daily activity after shifted here, a monkey came waking on the compound wall threatened her thinking she’s having something eatable in her bowl, which she use for collecting flowers. Though it doesn't do anything, she left the bowl on the wall and moved away and it passed as well. 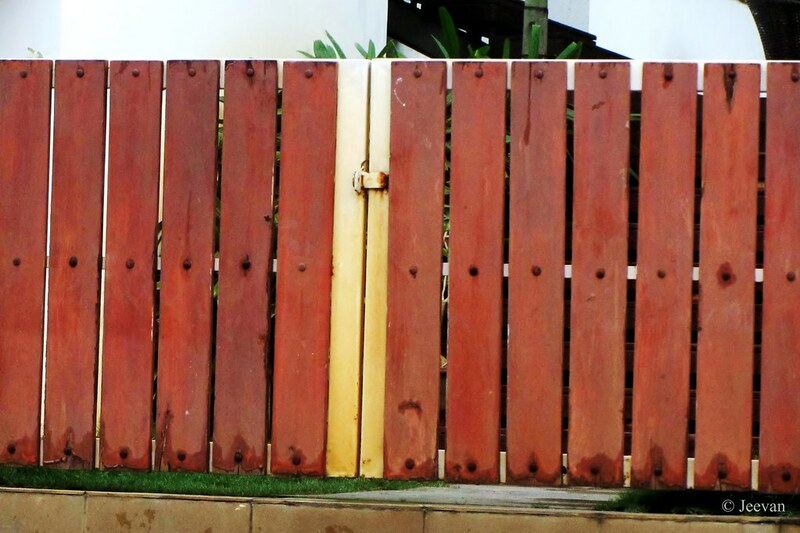 A wood planked gate of one of my neighbors… actually it is a gate of a construction office situated on our house lane, opposite to our side entrance. My grandfather (maternal) visited me yesterday on the sideline of my late great grandmother’s annual ceremony. I haven’t seen him for a very long time, as he wasn’t well to move out of his house or climbing down from his upstairs home. I was truly surprised when my grandma brings him home along with her. Since he was suffering from certain health setbacks in recent past, I didn’t expect him to visit me and for me it is hardly possible to meet him at his home in first floor and coming across their congested street in wheelchair is something quite awkward to image. Since it is hard to take a car inside their street and also post fracture last year, I am going through difficult times transferring between car and wheelchair. I feel so happy meeting him and I really moved looking into his eyes that was yearning to see me… His affection and care for me is something very special and is always evident through his eyes. Though he won’t speak much and couldn’t make gestures easily, I understand him quite well and I can’t explain how much I love him and he means to me. He is our best well-wisher and what and where we are today is only because of his chief intention along with his son’s (my late uncle) hard work, and selfless being provided us so many advantages in life. Until he closed his teashop at early 20s, he has been a hard worker and active being. For more than two decades he had been a cabs car and lorry driver, before started fulltime dairy business and opens the teashop. My uncle’s demise in late 2001 had hit him immensely and shutting down the teashop, left him jobless at home resulted in greater drawback at health followed by a cardiac arrest due to clot in heart. But in latter days he suffers from diabetic and nervous problem and the side effects of tablets forced him to quite depend on others. He could walk only at very slow pace and someone need to lift him from the chair to stand and being little obese it has been very difficult for my grandmother to take care of him. We ever expected him to become infirmity at this early age of 75, while older than him are progressing well. I am one of his main concerns to make him feel regret, and he had expressed his sorrow many time with granny for unable to help me in anyways. 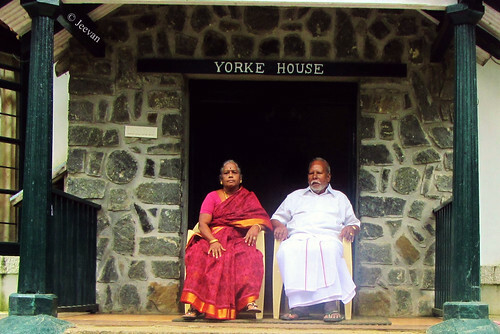 In 2001 he used to drive me every day to a clinic in T.Nagar here, where I took Ayurveda treatment for nearly two months. Driving through the heavy morning traffic is a true venture in his way of driving, though he manages only because of the eagerness to see me as a normal being. While studying in school, he used to pick me in his bicycle if I received none. Putting the bags on the handlebar, he pedals me to home placing me on the rear carrier, since my school was very close to their house. He had scolded me and also embraced at same, as he always had special attention towards me. I think it is our turn to take care of him, not only because he had worn-out his life for our self but true love he has shown for others and as children/grandchildren it’s our duty to support not only physically but also make him feel happy and content. At my stand I am conscious not to disturb him anyways, but I feel sorry that indirectly I’m one of the main concerns on his drawback stream. Emotionally he has been disturbed by others, forgetting whatever he had done for them and just for the brief of ego and updating their fake statues - though they deserved to be so – makes him feel anguish. Until 2012 he had traveled with me for many places, as I love doing it so, I am helpless now leaving him at home as he finds it very difficult to travel and getting in and out of the car, and in case of urgency he prefers Auto (rickshaw) to pick and drop him at doorstep. 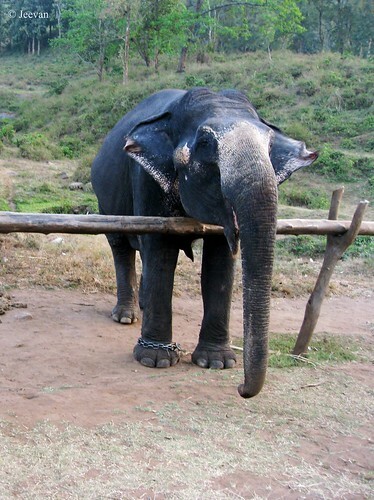 Pictures shot at Kozhikamuthi Elephant Camp at Top Sip, near Coimbatore. 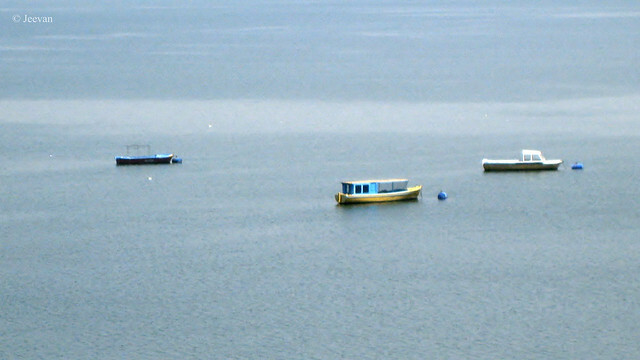 Stanley Reservoir is one of the largest fishing reservoirs in South India, River Cauvery as its main source of water. The water is retained by the Mettur Dam, which has a capacity of totally 90 Tmcft! 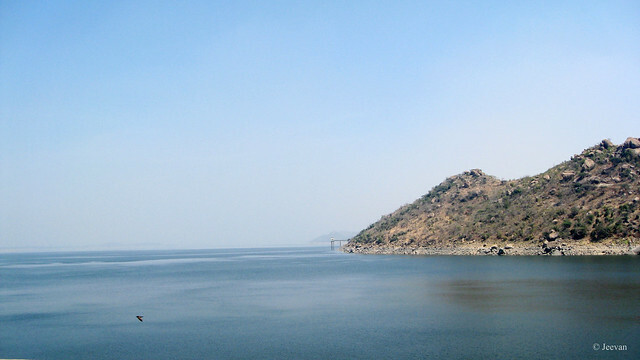 The creation of the reservoir means submersion of two villages, all of whose inhabitants were relocated to Mettur. Coffee and Tea has become an essential part of life and we grow up drinking either one of the other, depending on our lifestyle or taste buds; some take regularly or occasionally for refreshment and at the occasions of meetings and events, they becomes a treat. I know some who don’t drink coffee or tea, thinking it’s not good for health, but gulp bottles of soft drinks! There isn’t certain facts how much good or not taking coffee or tea, but in my opinion there’s a limit for everything. I enjoy both coffee and tea according to my desire at that moment, but my most favorite is coffee. Coming to the post, I just thought to share some of my memories related to Tea Urns (can) and the vendors carrying it on their bicycles to make life out of selling tea or coffee. Since my grandparents have done dairy business and owning a tea shop then, I grown up watching their day-to-day activities but the Tea Urns are seldom used by them. They make coffee or tea using the milk that kept heated in a vessel directly on the stove and being a crowded residential area, theirs was the only tea shop to open from early morning to night and they work hard to keep up customers. 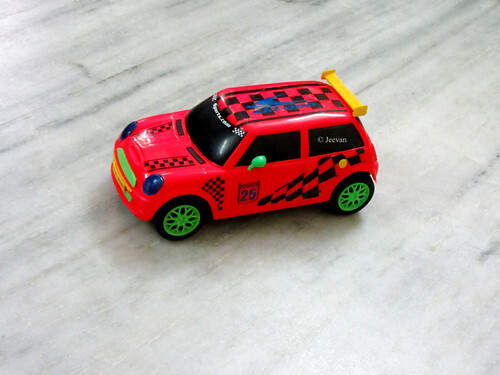 My grandparent’s house is situated in one of the crowded or congested street in south Chennai and getting in and out of it is an adventure and taking a car means stickers in scratches. The people here don’t need a reason to engage in street fights and it used to be an entertainment for the residents here, to come leaning on the wall and watching the scene. So, in a situation like this, the turmoil has been in its full swing related to the assassination. My grandparent’s does not only run a tea shop, but also reared dozen of milch buffalos and couple of cows in the backyard. So shutting down the tea shop means, lose of liters of milk. To avoid the situation, they sold the milk in black (market) through the side entrance of the house and the Tea Urn was filled and put on the street side to deliver tea. I accompanied my uncle while he took care of the Tea Urn, open and closing the tap filling the little tumblers with tea. Every time I see a vendor pedaling with Tea Urn in the streets, I remember that moment and my grandparent’s use on Tea Urn is rarity and I have seen it only left ideal on the loft. Apart this, there was also a ginger coffee vendor who later joined the neighborhood of my grandparents. It was also a period where the plastic or paper cups weren’t prevailed; so he used to take two small pails of water along with him, which used to hang on both sides of his bicycle’s rear carrier. He also put hang a wire basket on the handlebar with few dozens of steel tumblers, pressed one inside another, and once the customers sipped off he wash away the tumblers with the pails of water immediately, for another round of service. It was also interested to watch him tying the Tea Urn in his bicycle carrier, making sure it doesn’t fall off while pedaling on streets. In early 20s, there was a bicycle vendor who used to visit my uncle’s workshop regularly to supply tea and coffee to the employees. 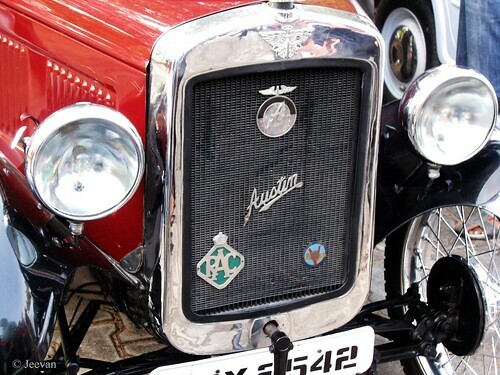 My uncle runs a Maruti (car) workshop at the ground floor of our native house in Adyar and while I am quite out of the school then, I used to watch his (bicycle vendor’s) activates from our balcony. He used to put stand his bicycle in front of the workshop, which means getting a good sight on his from the balcony and unlike the ginger coffee vendor, who sold only ginger coffee, he was capable of selling 4 in one (bicycle). He was such an active young person, and his hands used to play while he makes anything out of milk. 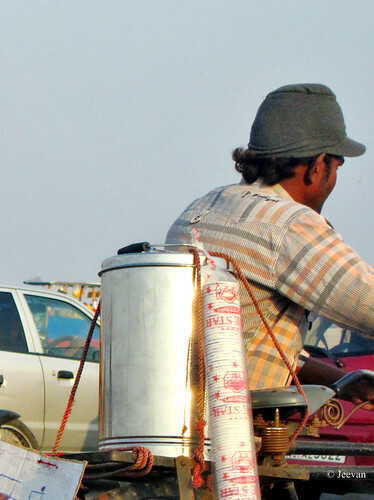 With one Tea Urn (filled with milk) tied to his bicycle carrier, he satisfies four kinds of taste buds with sufficient use of coffee and ginger powders, hot teas brew and spice ingredient. 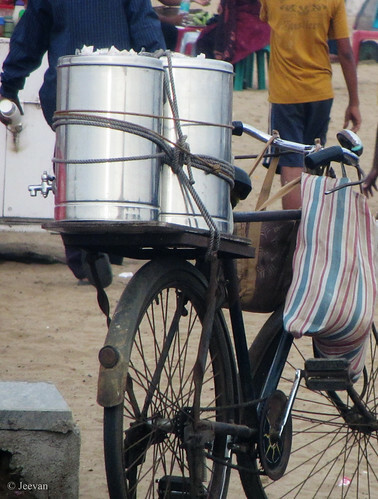 He used to come hanging two wire baskets on the handlebar, one had two vacuum flasks of hot milk and teas brew and the other with three cylindrical boxes containing powders of coffee, ginger and spice for making masala milk! It’s another great entertainment for me, then, watching his series exchanges made between the beverages according to the customer’s request. If it is for coffee, he picks up a little plastic cup (from a packet of series of cups that hang on the side of the Tea Urn) and drops a little spoon of coffee power and fills it with milk by opening the Tea Urn tap. Before he serves anybody, he make two long pours using another steel tumble he separately handled for this purpose. And for making tea, he opens of the flask and pours few mm of teas brew in the cup and makes another long pour after filled with milk. He maintained this act for every other beverage. Many a time I had taken coffee from him and those days the quality of content used to be somehow fine… but these days they are just hot water Tea Urns. Except hotels, restaurants and homes, coffee or tea has gone so bad in taste and thickness at tea shops and bicycle vendors. Once, the tea shops at countryside used to be excellent in beverage, with the use of direct cow or buffalo milk, but now, they also seems well spoiled by making use of packet milk. I really feel regret how well have we gone down in quality and quantity compared to early days. Not only beverage, anything u takes lacks quality today. P.S. Both the pictures were captured at Chennai Marina beach at various moments, and what inspired me to write this post. 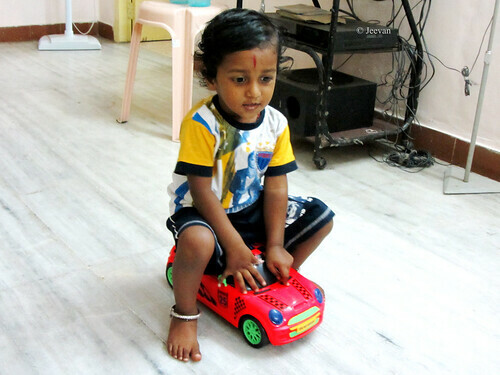 My nephew Barath is so passionate about cars and he is also capable of identifying any kind of vehicles at the age of 2.4! When he hears a siren, he gush ambulance and for him any sort of SUVs is Jeep. 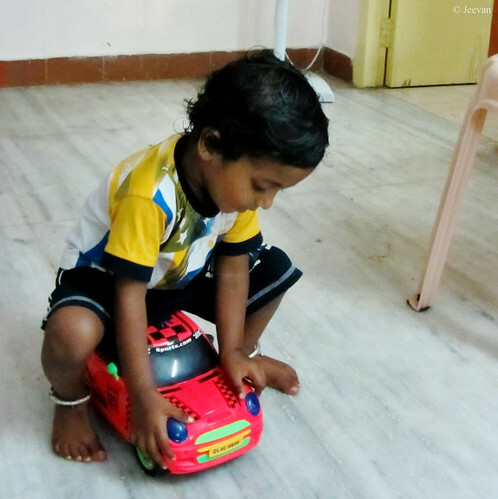 Here he rides his Swift car; actually it’s a pullback car but he likes only sitting on it and moving front and back. He cheers me excessively whenever he visits home and I really look forward to spent time with him, admiring his infant speech and childish behavior. He’s almost ready to go to lower kindergarten and so was his knowledge now. His parents teaches him through e-learning at their free time and being interested in watching television, he picks up easily with things he sees on screen. Everyone conveys to put him in school as he learns things quickly; I really wish he joins the regular kindergarten like most others children instead going to a preschool. I wish he enjoyed his childhood as much he could before fall into the enforced education system.